Background: Oral chemotherapeutic agents are being used in many types of cancer because of their efficacy and general acceptance by patients. Oral chemotherapies are perceived by patients to be easier to use and safer than intravenously administered chemotherapies; however, this may not necessarily be true. The St. Luke’s Mountain States Tumor Institute (MSTI) Oral Chemotherapy Service (OCS) monitors patients who are taking oral chemotherapies and evaluates patients for tolerability and adherence at least once per treatment cycle. Objective: To evaluate the duration of use of oral chemotherapies filled through the MSTI OCS compared with the duration as reported in clinical trials. Methods: We reported a retrospective chart review on all new prescriptions for capecitabine, temozolomide, lenalidomide, enzalutamide, or abiraterone filled at MSTI OCS between January 1, 2010, and December 31, 2013. Only prescriptions filled exclusively through the MSTI OCS and prescribed according to the US Food and Drug Administration indications for these medications were included. Prescriptions were evaluated for the length of time patients continued to use their medications and were compared with the duration of use reported in the clinical trials referenced in the prescribing information for each of these drugs. Results: A total of 367 new prescriptions were included in the final analysis. Patients who received treatment at MSTI OCS had similar or improved duration of use for capecitabine and temozolomide compared with the duration reported in clinical trials. By contrast, patients who received lenalidomide, enzalutamide, or abiraterone did not continue to use their therapy for as long as the durations reported in clinical trials. Conclusion: Patients who filled their prescriptions through the MSTI OCS had durations of use similar to the durations reported in the clinical trials for 2 of the 5 medications evaluated in this study—capecitabine and temozolomide. Because of their efficacy and general acceptance by patients, there has been an increase in the number of patients with cancer who have been receiving oral therapies in the past few years. Oral chemotherapies are perceived by patients to be easier to use and safer, although this may not necessarily be true.1 Many oral chemotherapeutic agents have side-effect profiles that are similar to intravenous treatments and can involve complicated regimens, and difficult administration instructions.1,4 For instance, capecitabine is an oral pro­drug of the parenteral medication fluorouracil, and therefore has side effects similar to fluorouracil, including diarrhea and hand-foot syndrome.1,5 Capecitabine must also be taken within 30 minutes of a meal, and the most common regimen requires the patient to take it twice daily for 14 days, then 7 days off. At St. Luke’s Mountain States Tumor Institute (MSTI), the Oral Chemotherapy Service (OCS) follows patients who are taking oral chemotherapies at home and communicates with them at least once at every treatment cycle. This follow-up is done by a telephone call, during which the pharmacists assess the patient’s medication adherence and side effects. The MSTI OCS process has been described previously.10 As a result of this additional monitoring, it is hypothesized that the patients who fill their prescriptions through the MSTI OCS may have increased adherence to oral chemotherapy regimens compared with other patients, and they more closely resemble adherence seen in clinical trials. This review aimed to evaluate how long patients continued to use their therapy compared with the duration of therapy seen in clinical trials. This retrospective chart review included all new prescriptions for adult patients with cancer who received capecitabine, temozolomide, lenalidomide, abir­aterone, or enzalutamide through the MSTI OCS between January 1, 2010, and December 31, 2013. These 5 medications were chosen after an evaluation of the top medications prescribed at the center in 2014. The prescribing information for each drug was reviewed to collect the data reported in the respective clinical trials,5-7,11,12 and then the published primary studies were reviewed to obtain the duration of use for each drug.13-26 Prescriptions were excluded if they were written for off-label indications, had to be filled through a mail order or other pharmacies, or were never actually dispensed to the patient. Data collected included the medication prescribed, the indication, dose, the date the prescription was written, the number of cycles received and the days per cycle, and the reason for discontinuation. All the included prescriptions were reviewed to determine whether the medications prescribed were filled exclusively through the MSTI OCS, and if they were written for an FDA-approved indication. The duration of time patients continued to use the medication was then evaluated. In the case of temozolomide use in patients with glioblastoma who received concurrent radiation, the percentage of patients who completed therapy was compared. A Wilcoxon signed-rank test for a single sample was used to run statistical analysis for continuous data. The hypothesized median used in this analysis was the median duration reported in clinical trials for the drugs. For nominal data, a chi-square test was used. A power analysis was not completed, and therefore a sample size was not calculated; however, a P value of ≤.05 was considered to be significant. During the review period, 1105 new prescriptions were identified. A total of 356 prescriptions were written for off-label indications, 149 were sent to a mail order or other pharmacies, 152 were never dispensed to the patient, 45 patients received free medications from the manufacturer, and 36 prescriptions were found to not be initial treatments. This left 367 prescriptions that were prescribed according to FDA-approved indications and filled exclusively through the MSTI OCS (Figure). The median durations of treatment reported in the clinical trials referenced in the prescribing information, and the median durations seen at MSTI during the review period are shown in the Table. The most common reasons for medication discontinuation were disease progression, treatment completion, side effects, and patients moving to hospice care or to comfort measures. Capecitabine is FDA approved for the treatment of patients with metastatic colorectal cancer, metastatic breast cancer, or Duke’s C colon cancer.5 There were 54, 71, and 29 prescriptions, respectively, filled at the MSTI OCS for these indications. The only indication that showed a longer duration of therapy at MSTI compared with that reported in clinical trials was metastatic breast cancer. Patients receiving capecitabine for metastatic colorectal cancer showed no difference in treatment duration, and patients with Duke’s C colon cancer had a significantly shorter duration of treatment than those treated in clinical trials. Temozolomide is FDA approved for use, concomitantly with radiation therapy, for the treatment of patients with glioblastoma multiforme; as maintenance therapy; and for patients with refractory anaplastic astrocytoma.11 There were 72 prescriptions written for glioblastoma—46 concurrently with radiation and 26 as maintenance regimens—and 1 prescription was written for anaplastic astrocytoma. The only indication that had a longer duration of therapy than reported in clinical trials was glioblastoma, as maintenance therapy. Patients who received temozolomide for glioblastoma concurrently with radiation had no significant difference in the percent completing therapy compared with those reported in clinical trials. Only 1 prescription was for anaplastic astrocytoma, resulting in insufficient data for a statistical evaluation. Lenalidomide is FDA approved for the treatment of patients with multiple myeloma; transfusion-dependent anemia caused by myelodysplastic syndromes associated with 5q deletion; or mantle-cell lymphoma.12 There were 55 prescriptions written for lenalidomide for all indications—45 for multiple myeloma, 8 for myelodysplastic syndromes, and 2 for mantle-cell lymphoma. Patients with multiple myeloma at MSTI did not continue lenalidomide therapy as long as patients in clinical trials. There were too few patients with myelodysplastic syndrome or mantle-cell lymphoma arms to allow for statistical evaluation. The only FDA-approved indication for enzalutamide and for abiraterone is the treatment of patients with metastatic castration-resistant prostate cancer.6,7 Each of these 2 medications reported data from 2 clinical trials in their respective prescribing information; therefore, results from the MSTI OCS were compared with the 2 medians reported. A total of 20 prescriptions for enzalutamide and 65 for abiraterone were included in the analysis. Patients who received prescriptions for enzalutamide or for abiraterone continued to use the drugs for a significantly shorter duration than that reported in their clinical trials. The problem with most medication adherence measures is that they do not always relate directly to taking the medication itself. 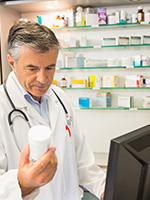 Some patient-reported measures have ways to get around them through patient-directed mechanisms, such as pill dumping or filling in dosing charts. Nonpatient-reported measures, such as refill rates, do not confirm whether a patient is actually taking the medication. The other issue is that we do not know what a given adherence rate in oncology translates to in terms of desired outcomes with cancer.28 Therefore, it was our hypothesis that the best way to evaluate the true benefit of an oral chemotherapy management program was to look at the outcomes and compare them with the primary outcomes of the clinical trials that led to the FDA approval of the medications. Several limitations should be taken into consideration. The patients evaluated in this review included only those who were prescribed a medication for an FDA-approved indication. The study had no exclusion criteria based on patient parameters; therefore, these patients are a fair representation of the general population. Patients were not matched to the exclusion and inclusion criteria of the clinical trials, which might have influenced the results. Because no calculations of sample size were done, and the sample sizes for each indication varied greatly, there is a risk for type II error. Other potential confounders may be that the intended duration of treatment and patient populations were not consistent with those in the clinical trials for all medications evaluated. Patients with multiple myeloma who received lenalidomide were included pre- and posttransplantation, which might have swayed the results toward a shorter duration of treatment. For the other medications evaluated, the regimen durations were the same as those in the clinical trials. As for patients who recieved enzalutamide or abir­aterone, the analysis period only included a short time after the approval of these 2 medications. Some of the patients included could have been waiting for the approval of these medications, and thus had disease progression in the interim—the results might have been skewed because of the severity of disease in these patients compared with those in clinical trials. 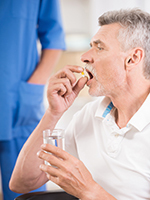 Adherence to oral medication regimens can be difficult to measure. This review showed that the additional monitoring and counseling performed by the MSTI OCS pharmacists resulted in similar or prolonged durations of therapy compared with those reported in clinical trials of capecitabine and temozolomide; however, this was not the case for lenalidomide, abiraterone, or enzalutamide. Because it is difficult to measure patient adherence in the real-world setting, if patients are continuing to use their medication for as long as or longer than patients in clinical trials, it is speculated that these patients will have similar outcomes as those included in the clinical trials. Further analysis of the utility of this type of measure for the success of a program is encouraged. Dr Mancini is on the Speaker’s Bureau of Millennium and a consultant for Taiho. Dr Hogue and Dr Ineck have no conflicts of interest to report. 1. Weingart SN, Brown E, Bach PB, et al. NCCN Task Force report: oral chemotherapy. J Natl Compr Canc Netw. 2008;6 Suppl 3:S1-S14. 2. CenterWatch. 2017 FDA approved drugs. www.centerwatch.com/drug-information/fda-approved-drugs/. 3. CenterWatch. 2016 FDA approved drugs. www.centerwatch.com/drug-information/fda-approved-drugs/. 4. Partridge AH, Avorn J, Wang PS, Winer EP. Adherence to therapy with oral antineoplastic agents. J Natl Cancer Inst. 2002;94:652-661. 5. Xeloda (capecitabine) tablets [prescribing information]. San Francisco, CA: Genentech; 2014. 6. Zytiga (abiraterone) tablets [prescribing information]. Horsham, PA: Janssen Biotech; 2014. 7. Xtandi (enzalutamide) capsules [prescribing information]. San Francisco, CA: Astellas Pharma; 2014. 8. American Society of Clinical Oncology. Side effects of chemotherapy. August 2017. www.cancer.net/navigating-cancer-care/how-cancer-treated/chemotherapy/side-effects-chemotherapy. Accessed November 1, 2017. 9. Unnikrishnan R, Veeraiah S, Mani S, et al. Comprehensive evaluation of adherence to therapy, its associations, and its implications in patients with chronic myeloid leukemia receiving imatinib. Clin Lymphoma Myeloma Leuk. 2016;16:366-371. 10. Mancini RS, Kaster LM, Vu B, et al. Implementation of a pharmacist-managed interdisciplinary oral chemotherapy program in a community cancer center. Journal of Hematology Oncology Pharmacy. 2011;1:23-30. 11. Temodar (temozolomide) capsules [prescribing information]. Whitehouse Station, NJ: Merck; 2014. 12. Revlimid (lenalidomide) capsules [prescribing information]. Summit, NJ: Celgene; 2014. 13. Van Cutsem E, Twelves C, Cassidy J, et al; for the Xeloda Colorectal Cancer Study Group. Oral capecitabine compared with intravenous fluorouracil plus leucovorin in patients with metastatic colorectal cancer: results of a large phase III study. J Clin Oncol. 2001;19:4097-4106. 14. Hoff PM, Ansari R, Batist G, et al. Comparison of oral capecitabine versus intravenous fluorouracil plus leucovorin as first-line treatment in 605 patients with metastatic colorectal cancer: results of a randomized phase III study. J Clin Oncol. 2001;19:2282-2292. 15. O’Shaughnessy J, Miles D, Vukelja S, et al. Superior survival with capeci­tabine plus docetaxel combination therapy in anthracycline-pretreated patients with advanced breast cancer: phase III trial results. J Clin Oncol. 2002;20:2812-2823. 16. Blum JL, Jones SE, Buzdar AU, et al. 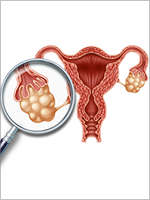 Multicenter phase II study of capeci­tabine in paclitaxel-refractory metastatic breast cancer. J Clin Oncol. 1999;17:485-493. 17. Twelves C, Wong A, Nowacki MP, et al. Capecitabine as adjuvant treatment for stage III colon cancer. N Engl J Med. 2005;352:2696-2704. 18. Stupp R, Mason WP, ven den Bent MJ, et al; for the European Organisation for Research and Treatment of Cancer Brain Tumor and Radiotherapy Groups, and the National Cancer Institute of Canada Clinical Trials Group. Radiotherapy plus concomitant and adjuvant temozolomide for glioblastoma. N Engl J Med. 2005;352:987-996. 19. Yung WK, Prados MD, Yaya-Tur R, et al; for the Temodal Brain Tumor Group. Multicenter phase II trial of temozolomide in patients with anaplastic astrocytoma or anaplastic oligoastrocytoma at first relapse. J Clin Oncol. 1999;17:2762-2771. Erratum in: J Clin Oncol. 1999;17:3693. 20. Dimopoulos MA, Chen C, Spencer A, et al. Long-term follow-up on overall survival from the MM-009 and MM-010 phase III trials of lenalidomide plus dexamethasone in patients with relapsed or refractory multiple myeloma. Leukemia. 2009;23:2147-2152. 21. List A, Dewald G, Bennett J, et al; for the Myelodysplastic Syndrome-003 Study Investigators. Lenalidomide in myelodysplastic syndrome with chromosome 5q deletion. N Engl J Med. 2006;355:1456-1465. 22. Goy A, Sinha R, Williams ME, et al. Single-agent lenalidomide in patients with mantle-cell lymphoma who relapsed or progressed after or were refractory to bortezomib: phase II MCL-001 (EMERGE) study. J Clin Oncol. 2013;31:3688-3695. 23. Beer TM, Armstrong AJ, Rathkopf DE, et al; for the PREVAIL Investigators. Enzalutamide in metastatic prostate cancer before chemotherapy. N Engl J Med. 2014;371:424-433. 24. Scher HI, Fizazi K, Saad F, et al. Increased survival with enzalutamide in prostate cancer after chemotherapy. N Engl J Med. 2012;367:1187-1197. 25. Basch E, Autio K, Ryan CJ, et al. Abiraterone acetate plus prednisone versus prednisone alone in chemotherapy-naive men with metastatic castration-resistant prostate cancer: patient-reported outcome results of a randomised phase 3 trial. Lancet Oncol. 2013;14:1193-1199. 26. Fizazi K, Scher HI, Molina A, et al; for the COU-AA-301 Investigators. Abiraterone acetate for treatment of metastatic castration-resistant prostate cancer: final overall survival analysis of the COU-AA-301 randomised, double-blind, placebo-controlled phase 3 study. Lancet Oncol. 2012;13:983-992. Errata in: Lancet Oncol. 2012;13:e464; Lancet Oncol. 2014;15:e365. 27. Ruddy K, Mayer E, Partridge A. Patient adherence and persistence with oral anticancer treatment. CA Cancer J Clin. 2009;59:56-66. 28. Spoelstra SL, Given BA, Given CW, et al. An intervention to improve adherence and management of symptoms for patients prescribed oral chemotherapy agents: an exploratory study. Cancer Nurs. 2016;36:18-28. 29. Boumard A, Henin E, Tinquaut F, et al. Adherence to oral anticancer chemotherapy: what influences patients’ over or non-adherence? Analysis of the OCTO study through quantitative-qualitative methods. BMC Res Notes. 2015;8:291. 30. Cheung WY, Lai EC, Ruan JY, et al. Comparative adherence to oral hormonal agents in older women with breast cancer. Breast Cancer Res Treat. 2015;152:419-427. 31. Anderson KR, Chambers CR, Lam N, et al. Medication adherence among adults prescribed imatinib, dasatinib, or nilotinib for the treatment of chronic myeloid leukemia. J Oncol Pharm Pract. 2015;21:19-25. 32. Neven P, Markopoulos C, Tanner M, et al. The impact of educational materials on compliance and persistence rates with adjuvant aromatase inhibitor treatment: first-year results from the compliance of aromatase inhibitors assessment in daily practice through educational approach (CARIATIDE) study. Breast. 2014;23:393-399.